Nerve entrapments like carpal tunnel syndrome are more prevalent in patients with diabetes, especially in those with diabetic sensorimotor polyneuropathy. Recently the prevalence of tibial nerve entrapment at the tarsal tunnel was reported in a diabetic population of 416 subjects and a control group of 196 volunteers. The neuropathic symptoms and higher sensory thresholds in (compressed) tibial nerve innervated areas were significantly more prevalent in diabetic patients. This provides evidence for the role of super-imposed entrapment neuropathy in diabetes related neuropathy, which is thought to relate to risk of ulceration. The aim of the current study was to assess the risk for diabetic foot ulceration in patients with tarsal tunnel syndrome (TTS), compared to diabetic subjects without signs of tibial nerve entrapment. Patients with TTS and patients without tibial nerve entrapment at baseline participating in the prospective Rotterdam Diabetic Foot Study were followed for three years. Status of diabetic foot ulceration was assessed annually. Ulceration rates at three-year follow-up were estimated with Kaplan-Meier survival analysis. Events were diagnosed as the occurrence of an ulcer and time to event was time to diagnosis of ulcer. In the 416 patients studied, a unilateral TTS was observed in 29.9% (CI: 25.2-34.5%) of patients and 17.8% (CI:13.9-21.5%) had a bilateral TTS. The mean follow-up was 1142 days (CI: 1110-1173), including patients who died during follow-up. Three-year ulceration rates were significantly higher for the group with unilateral TTS compared to subjects without signs of tibial nerve entrapment (17.1% vs. 9.5%, p=.041), see Figure 1. 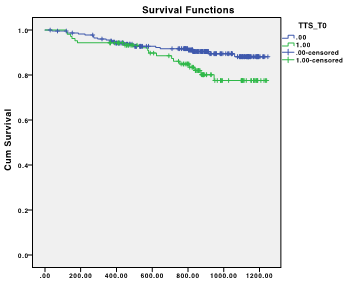 The group with bilateral TTS showed the same trend (18.2% vs. 10.7%, p=.093), see Figure 2. Figure 1: Risk for ulceration in unilateral TTS. Figure 2: Risk for ulceration in bilateral TTS. TTS results in a higher risk for diabetic foot ulcers, compared to diabetic subjects without tibial nerve entrapment, at three-years of follow-up. This study provides evidence for the deterioration of nerve function as a result of nerve entrapment on top of diabetic neuropathy. Since treatment options for the entrapment component of neuropathy are available, a surgical release might lower the risk for incident diabetic foot ulceration.